If you enjoy exploring the great outdoors, then you need the perfect mountain bike for your adventures. I love my mountain bikes, and I will admit that I own quite a number of models. When I first started mountain biking, I had to find an entry level bike that could take me safely and comfortably from one point to another. At the same time, I didn't want to spend too much money on one bike, because it was just my first investment. As a beginner mountain biker, you are probably in the same spot that I was in years ago. You might be stuck worrying about which bike to choose, but luckily you have me in your corner. The mountain bike that we will look at below is safe, comfortable, functional, and exceptionally affordable. This Mongoose mountain bike will take your trail performance to a whole new level, so that you will quickly fall in love with this sport. So if you are looking for an entry level bike that gives you more value for money, then this check out the Ledge 2.1 reviews below. The Ledge 2.1 has been designed with spectacular features, which are bound to take your riding to the next level. These features include a full suspension frame, suspension fork, Shimano rear derailleur with 21 speeds, twist shifters, a 3-piece crank, linear pull brakes, 26-inch wheels, a steel handlebar, and alloy rims. The frame of your bike forms the base of your ride. If you invest in a poor quality frame, then you will find that your ride is uncomfortable and unenjoyable. That is why Mongoose has decided to use a solid aluminum frame, which is lightweight and durable. This full suspension frame will give you the support, stability, and comfort that you need, so that you can have extreme fun during your ride. The frame is also complemented by a suspension fork, which dampens vibrations so that you can have maximum control of your bike on rough terrain. And for added control you have steel handlebars. These handlebars will keep you on track during your ride. The Mongoose Ledge 2.1 also comes with a Shimano rear derailleur and a 3-piece crank, which deliver great gearing for your ride. 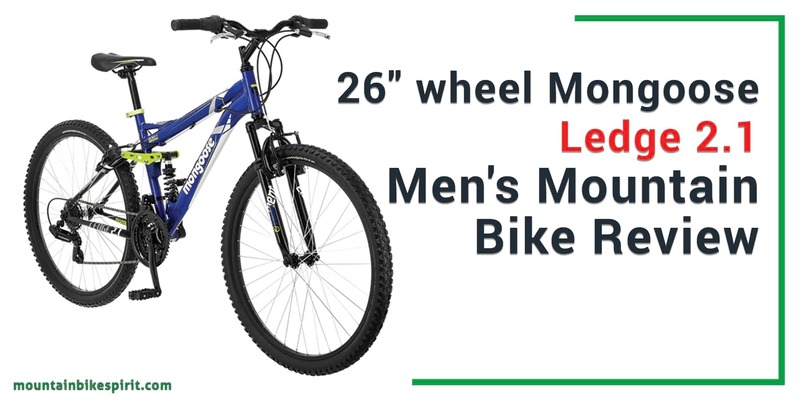 This mountain bike offers a 21 speeds, so that you can ride as fast as you want at all times. The Ledge 2.1 mountain bike also has twist shifters, so that you can switch between different gears with speed and precision. When it comes to braking, the linear pull brakes will help you out. These brakes will ensure that you can stop quickly and reliably in all weather conditions. Last but not least, Mongoose uses a good quality wheelset on this mountain bike. The bike has alloy rims, which provide stability and lightweight durability on different terrain. Additionally, the bike has 26-inch wheels for easy maneuvering in tight spaces. The Mongoose Ledge 2.1 does not have very many online reviews , however, from the people who have left reviews on Amazon and Walmart, you can make your own determination on this bike. Many customers have complemented the fact that the mountain bike has adjustable features, such as an adjustable handlebar which allows you to have a comfortable ride. Furthermore, this bike comes with a lightweight aluminum frame and plenty of gearing options, and cyclists are happy that they get these features at such an inexpensive price. However, there are aspects of this bike that can be improved, such as the fact that the wheels are not quick release. There are also some complaints of broken pedals, however, most customers seem very happy with the quality of the bike. All in all, this 40 lbs bike has made very many people happy. As you can see, the Mongoose Ledge 2.1 has quality features that allow you to enjoy mountain riding without any hassle. This bike is an excellent entry level bike, and it will allow you to comfortably and safely ride on different terrain. You won't find better for this price.